Michigan J. Frog. But Marvin is second, edging out The Tasmanian Devil. Each appeared in exactly five theatrically-released cartoons, but Taz is less obscure because he did, at least, have a name. Marvin's wasn't bestowed on him until decades later, when director Chuck Jones, who played a large part in his creation, needed a handle to refer to him by. The Martian without a name first appeared in Haredevil Hare (released July 24, 1948), in which Bugs Bunny became the first living thing to set foot on the Moon, only to become immediately involved in a struggle with the second, an odd little alien who landed moments later. You could tell the alien was a Martian not just because his space ship was labeled "Mars to Moon Expeditionary Force", but also because he was dressed like classical renditions of the Roman god of war after whom the planet was named, with a brush-topped helmet and a kilt (tho his fit him like a tutu). It looked more than a little silly, tho, on a guy designed like an upright, four-limbed ant, but without antennae or anything resembling a mouth, who also wore tennis shoes almost as big as his head. Marvin's other co-creators were Michael Maltese, who wrote the script, and Mel Blanc, who provided a truly geeky voice for the weird little guy. They apparently hadn't planned him as a recurring character; but the next time Jones directed a cartoon that included an alien (Hasty Hare, 1952), Marvin was back. Marvin's best-known role was in Duck Dodgers in the 24½th Century (1953), where he and Daffy Duck (assisted by Porky Pig) vied for control of Planet X in a hilarious send-up of Buck Rogers and every other sci-fi shoot-'em-up. In that one, tho, he didn't use his most famous schtick — wanting to blow up Earth because it obstructed his view of Venus. Marvin made two more appearances during the classic era of Warner Bros. animation: Hare-way to the Stars (1958) and Mad as a Mars Hare (1963). The former was notable for its highly unusual and stylized setting — a space city, full of planes and angles, apparently made of glass, and designed by art director/background man Maurice Noble. In both, the Martian played against his original antagonist, Bugs Bunny. All five were directed by Jones. The character never made it into comic books, lunch boxes, underoos or anything else. Even without media tie-ins to reinforce his image, audiences came to know those five cartoons quite well over the years, as they ran repeatedly on TV, as part of several Warner Bros. cartoon packages. And their yet-unnamed alien gradually began to catch people's fancy. When Bugs, Daffy, et al. started popping up in occasional new productions, as segments in prime-time animated specials, some of their supporting characters started popping up with them — including Marvin. Marvin's name seems to have made its debut in The Bugs Bunny/Road Runner Movie, Jones's 1979 compilation of old Warner Bros. shorts — it appeared under a picture of him in a portrait gallery. He didn't yet have his middle name, so it was just "Marvin Martian", but the "the" was added inside later. On May 21, 1980, CBS aired Bugs Bunny's Bustin' Out All Over, which contained Spaced Out Bunny, Marvin's first new appearance in 17 years. Duck Dodgers in the Return of the 24½th Century (1981) finally established him as a star. Since then, there have been lunch boxes and underoos galore, and he's even made it into a few comic books (published by DC Comics, now part of the same media mega-conglomerate as Warner). He's been in several new productions (voiced by Bob Bergen, whose voice is also heard in Toy Story, Powerpuff Girls and elsewhere, since Mel Blanc died), including a role on Tiny Toon Adventures, playing opposite Plucky Duck (in which, by the way, viewers first saw another member of his species). He's even made a guest appearance on The Simpsons. And of course, he was in Space Jam. Currently, he's the recurring villain in Warner's half-hour Duck Dodgers TV show. 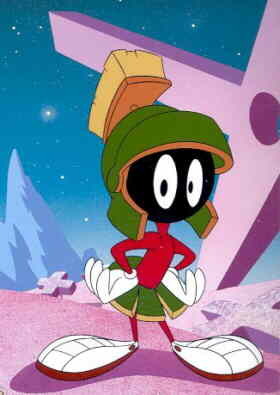 Marvin the Martian may not have been fully appreciated in his time, but he was a star right from the beginning. It just took a little while for people to realize that. Text ©2002-09 Donald D. Markstein. Art © Warner Bros.